I'm wondering that this didn't get more attention by now. The EFF published a list of companies and show how they protect their users from data requests of the government. Graphic by EFF / CC License BY - Please note: Myspace got awarded 2 stars after the table was released. Now there are some interesting conclusion to make. While Google protects their users well (4 stars), Apple seems not to care at all (1 star). 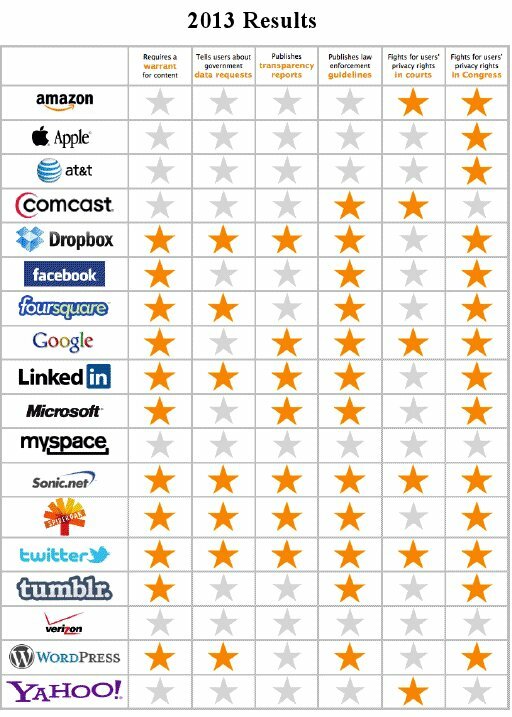 Only Verizon and myspace scored worse, myspace got 2 stars afterwards, after a representative got in contact with the EFF and explained things. Winner is Sonic.net, a ISP and Webhoster, and Twitter. They both achieved the maximum of 5 stars. This says a lot about a company, and should get more attention imho. While lamenting, users need active protection from unnessecary access to their data, and need knowledge if a request has been done. It's unbelievable that any company hands out data without a warrant for the content. I never would trust anything to someone who doesn't even want that. I'm speechless.